Even when you’re in the depths of a cold and snowy winter, looking out at or being in a winter garden doesn’t have be dull or ugly. When well-designed and planted with ornamental foliage and form combined with colorful stems and fruit, they delight, invite, and inspire you to look out and perhaps venture outside to explore. Winter is also the perfect time to appreciate the more subtle beauty of tree bark and silhouettes, and how evergreen conifers can anchor a winter garden planting composition, but also a garden’s basic underlying structure. The spaces and shapes – the structural ‘bones’ of a well-designed garden that are created by the paving, walls, paths and garden beds are easier to see in a bare winter garden. 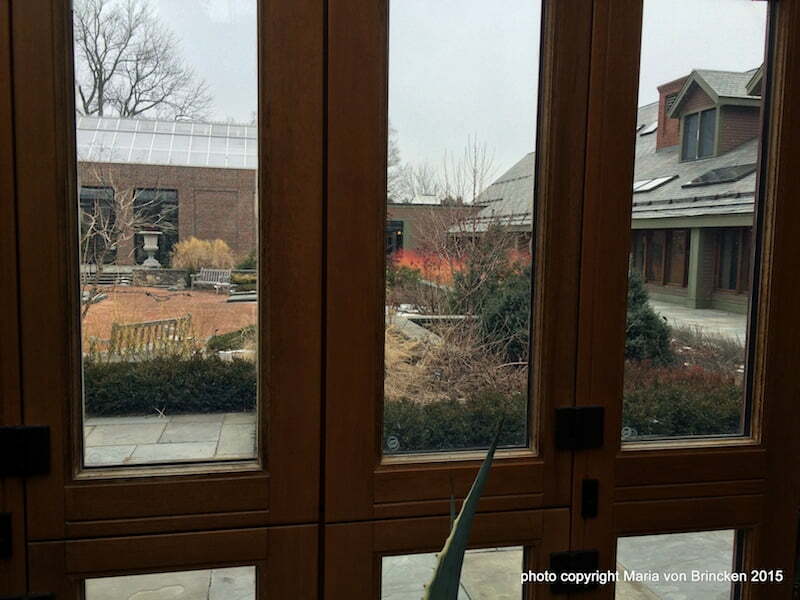 Here’s a few of my favorite winter gardens from recent winter treks to public spaces. 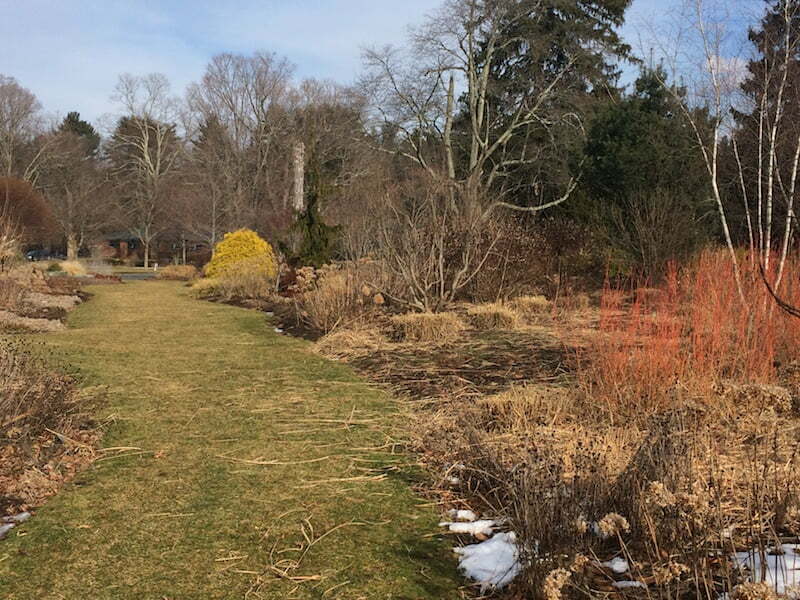 The first garden features a planting combination at the Bressingham Garden, Massachusetts Horticultural Society at Elm Bank. Magnificent and inspiring in summer, the garden does not disappoint in winter. 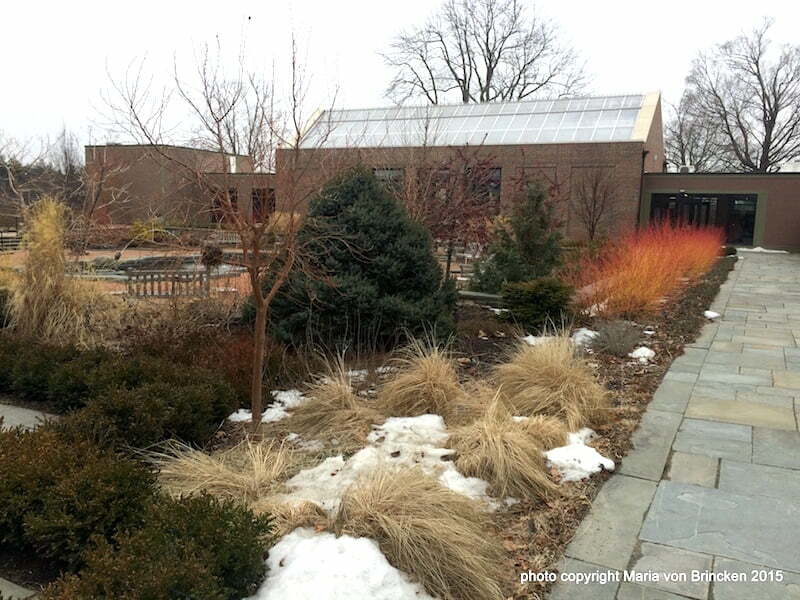 The plantings show off the creamy-silver bark of river birch trees (Betula nigra variety) highlighted and lit up by the upright vivid-orange stems of Cornus sanguinea ‘Midwinter Fire’ with the flat-topped tufts of the recently cut-down ornamental grasses. Bressingham Garden, MA – views along a garden path. Looking along the nearby garden path, notice how the splash of solid color in the distant golden conifer draws the eye (and the feet) through the garden. 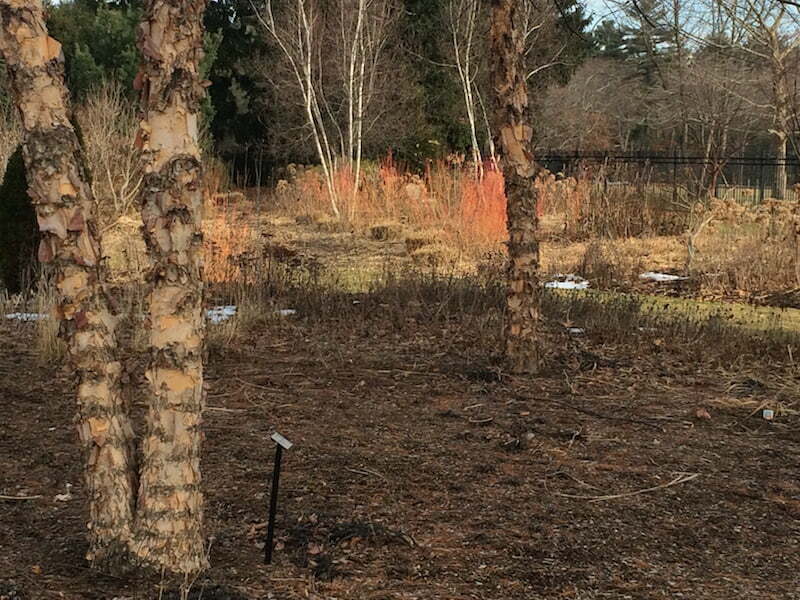 The next garden also showcases an effective use of the dogwood shrub ‘Midwinter Fire’, but in a more formal garden setting. In the “Winter Garden” at Tower Hill Botanical Garden, Boylston, MA, we see the orange stems of Cornus sanguinea ‘Midwinter Fire’ blazing away and contrasting nicely with the green of evergreen conifers, reddish plum colored fruits still hanging on the bare silhouette of a crab apple, and the winter creamy-brown of the grasses. Note how the evergreens keep some weight in the composition with their deep color and strong form and how they also highlight the delicate tracery of the deciduous plants and make a color contrast with the orange-red Cornus stems. 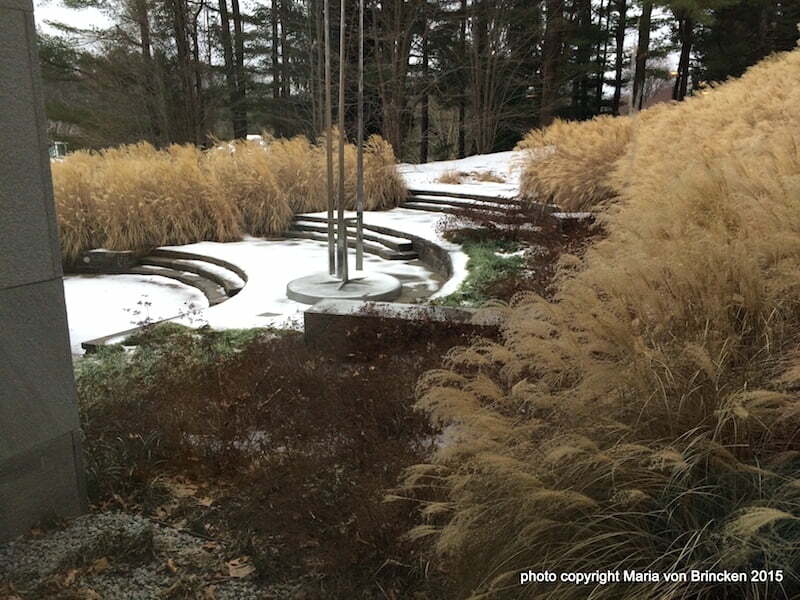 In the third garden, a sea of grasses in their splendid winter brown are used effectively in the Decordova Museum’s entry gardens. It also shows that you can leave your winter grass cutdown until later in February to get the full benefit of that winter foliage that’s so beautiful set against the white snow. 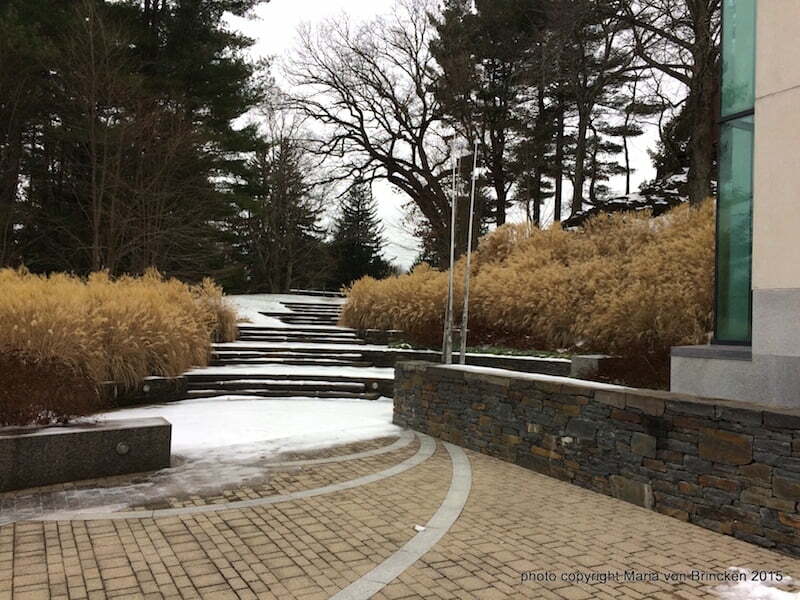 These public gardens inspire us and give ideas about what a winter landscape can aspire to be. As a designer I start with the winter landscape and then layer in the spring, summer, and fall. That means, designing the shape of the spaces with paths, patios, walls, and planting beds first. Then I add seasonal change with planting drifts, masses, moving lines, and individuals of conifers and broad-leaf evergreens, deciduous trees and shrubs. The last part of the design is working in the perennials that will flower from spring to frost in combination with flowering shrubs and trees. Designing with a seasonal progression in mind means we can enjoy our landscapes and gardens all year round.